I am currently waiting for some code to compile and found a bit of time to type up a quick blog. As described in a previous post, I am have set up my laptop to host Windows in a virtual machine guest with Mac OX (Mountain Lion) as the host. Today, I needed to compile some code and thinking I was being clever, I put the code on the host OS (OSX) and shared the folder via VM-ware to the Windows guest OS. I ran my msbuild process from the shared folder, and it took FOREVER to compile. The obvious choice here is of course to blame virtualisation itself – after all, I only have 2 cores allocated to the virtual. Just like with SQL Server, I start my tuning at a very high level (in this case, task manager) and dig in from there. The first question we ask ourselves as tuners is: Does what I see make sense? In this case, it obviously doesn’t. MSBUILD is set up to build highly parallelised, it should be using my cores and there are no obvious I/O bottleneck in the system. Having 50% of two cores busy (and with high kernel times) looks a lot like a single threaded bottleneck to me. The build was taking over 15 minutes, which was much longer than expected. Normally, I use xperf to troubleshoot servers. But it sure comes in handy for misbehaving client machines too. Task manager only shows that the time is spend in the process d.exe – which is part of the build process. Is the compiler bad or must we look elsewhere? Sure would be surprising if the compiler used all the kernel time wouldn’t it? This captures a sample of the stack and CPU usage of each process and kernel module. From here, it is quite clear what is going on – let me walk you through the analysis. First, open the trace with xperfview. I recommend staying with the Win7 version of xperfview, as the Win8 interface is… well… a Win8 interface. 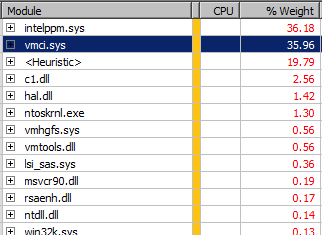 Aha!… Most of the CPU burn goes in vmci.sys (just ignore intelppm.sys). This isn’t a part of Windows. 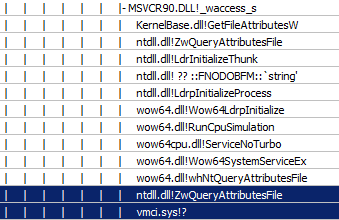 Its relatively easy to trace this file back to VM-ware. Eureka: It is file system access that is causing the slowdown. See the call stack? Starts from GetFileAttributesW and ends up inside vmci.sys. And the total build time is down from over 15 minutes to less than 3 minutes. I had trouble like this a while back in parallels. I switched my shared folders over to samba on the host and the problem went away. Parallels fixed it in a subsequent version. When I switched to VMware I noticed the slowdown in IO again. I haven’t tried going back to samba but am just about to.